Signature :ECHIGO KAMI KANESADA 2ND GENERATION. Shinto:Jyo Jyo saku:Oo wazamono cutting test ranking.Settsu. AOI Bijyutsu Syoshin(genuine) Kanteisyo: NBTHK Tokubetsu Hozon Kanteisyo. The blade was polished by nice polisher. Blade length : 54.4 cm or 21.42 inches. Sori :1.3cm or 0.5 inches. Width at the hamachi : 3.13cm or 1.232inches. Width at the Kissaki :2.11 cm or 0.83 inches. Kasane :0.69 cm or 0.27 inches. Shape : The blade is longer size wakizashi and wide and thick witu rather deep sori and longer kissaki. Jigane :Koitame hada well graine dwith jinie attach beautiful oosaka jigane. Hamon :niedeki suguha from the hamach with thick nioikuchi and then active gunome midare and oo gunome midare continue and also doranba hamon with thick nioikuchi and sunagashi, kinsuji work vividly. 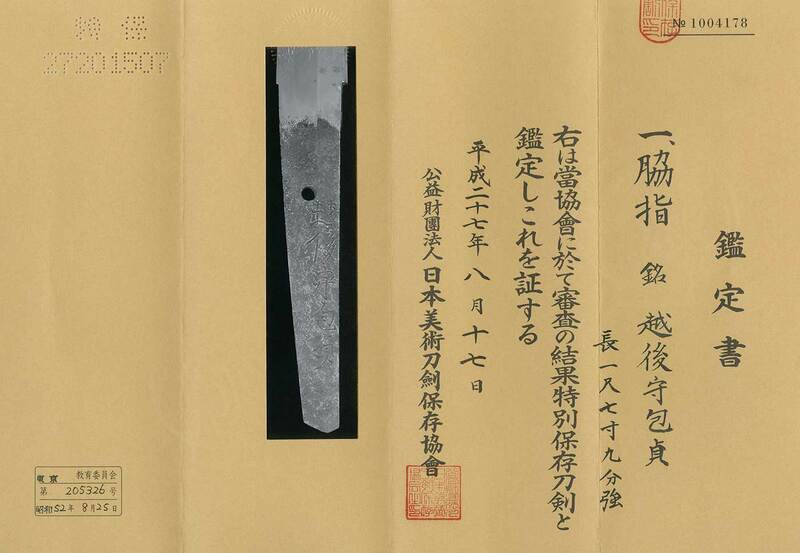 Special feature:Echigo (No) Kami Kanesada the Second forged this katana. It is said that he was born in Mino or Kochi province. He learned under Kanesada the First at Osaka and later became a son-in-law. The Second was superior to the First and ranked at O-waza-mono. Excellent worknanship was on the same level with Tsuda Sukehiro and Inoue Shinkai. Saya :Black color twisted saya. Tsuba :On the round shape amida yasuri like Saotome elegant and nice iron color. Menuki : solid gold dragon nice engraving. Fuchikashira and Kojiri: waves and plovers are engraved nice work. than Sukehiro. Kosirae is also fantastic nice Koshirae and also very goo condition. solid Menuki is high quality. Back ground of age: Tokugawa Edo period, Edo was peacefur country. so sword makers were also made gorgeous sword active Doranba and also Cyoji midare hamon. Aoi Bijyutsu Syoshin estimation paper :NBTHK Tokubetsu hozon paper.